Published by Seido Japan on June 21, 2016. Having one's training's cloths embroidered is the most common thing in Japan. However, westerners often know just little about this topic and some struggle with making the right choice. That is why in this article we are going to talk about embroidery content, show some common mistakes and give advice on how to avoid them and last but not least, explain how we make them at Seido. First of all: How come that we embroider our names on our Aikido equipment? Originally, it is a sign of modesty, meaning that you do not consider yourself as important enough to be remembered by the teacher! If you have at least one embroidery on your cloth, the teacher can always call you by your name as soon as he wants to refer to you. Especially at a place like the Hombu Dojo with several hundred practitioners, it is important and even considered as impolite, if you join a class without embroidered clothing. An eyewitness recently told me, that in such a case, one of the teachers (I will not mention his name) would even go as far as to write your name with a permanent ugly marker on the jacket of your sleeve, right during the class. With this background, it is obvious now, that the embroidery content should consist of nothing else but your name and possibly also the school or club name you are attached to or, on belts for example, the martial art you practice at an easily visible place. Right hip on the Hakama and left sleeve of the jacket is the classic option. Japanese generally use - often even when talking to close friends - only their family name but almost never their first name. However, westerners rather embroider their first name - and in Japan, you are expected to do so as foreigner. The reason is quite simple. First, the shorter the embroidery the easier it is understood by Japanese, and second, Japanese are used to hear foreigner names (TV shows, drama, English classes at school, etc.) so it's easier for them to read a previously heard first name than a less common family name. Anyways, when practicing in Japan, you will be called by the name embroidered on your cloths, or eventually a diminutive/nickname if your name is too complicated to pronunce for a Japanese. Outside of Japan, however, embroideries loose the simply practical aspect- as most westerners actually cannot read it but nonetheless frequently embroider their cloths in Japanese. It also looks like it is somehow "fancy" to opt not only for one's name, but have another word or expression, a nickname, even a poem written on the equipment. Ok, let's admit it, we sometimes are little amused when we get such orders. But do not forget that there are not only Japanese but also other practitioners who can read Japanese and such an embroidery can be seen as somewhere between simply funny, puzzling or ridiculous. In addition, there is actually one no-go, that you should avoid: adding "Sensei" to your name. No matter what rank they are, Japanese never refer to themselves as "Sensei". For those who do not know, this expression is used as honorific title when you talk about or directly address teachers for example or other people who have achieved a certain level or mastery in a certain field. It is added after and not - as westerners by mistake often do - before the name. It is "Miyamoto Shihan", "Miyamoto Sensei", or "Miyamoto-dono" in specific circunstances (when it's a teacher you know, you can skip the name and use only "Sensei", but never "Sensei Miyamoto" or "Shihan Miyamoto"). Therefore, you should not add "Sensei" (or also "Shihan", or the honorific suffixes "-san/-sama" ) as embroidery content, even if the item is a gift for your teacher. You'd rather add his title on a note you'll give him with the present. There are actually several ways to have your name written in Japanese, let me introduce the two most common ones. Most westerners like the Japanese Kanji, the logographic characters based on the Chinese writing. So there is a technique called Ateji, a way of writing every non-Japanese word - like foreign names - using Kanji representing it phonetically. Indeed, this may look really nice, at least exotic at first sight, but the actual meaning of the characters is in second place. And this is where it gets complicated. If for example you have the syllable "so" in your name, you could already choose from about 30 different Kanji - all representing this, but often not exclusively this - sound. Or in other words, there are countless possibilities to write a name using Kanji. And, because almost all Kanji have several different pronunciations, countless possibilities to read it "wrongly". For a "well made" Ateji, one would as far as possible, only choose Kanji that have only one reading and hence choose their phonetic rather than semantic qualities. This was the only way foreign words, religious expressions in Sanskrit or from the 16th century onwards Portuguese and later Dutch words etc, could be written in Japanese. For example "France" became: 仏蘭西 read "Fu-Ran-Su", using the Kanji for "Buddha - Orchid - West". In short: Although pretty, using Ateji usually is confusing to people who can read Japanese and therefore not the best solution for an embroidery. The less pretty but more adequate choice for foreign name transcription would be to use the syllabary called Katakana. This writing system consists of 48 simplified characters (coming from Kanji parts) that are in the present basically used to transcribe loanwords or other foreign language words. Hence, a foreign word is written by choosing the phonetically closest syllables existing. Origin of the Katakana. In red, the part taken to form a katakana having the same sound as the Kanji. Wikipedia article. With this background, you may start to guess the complexity when it comes to translate your name for your embroidery and especially why we do not offer Ateji. 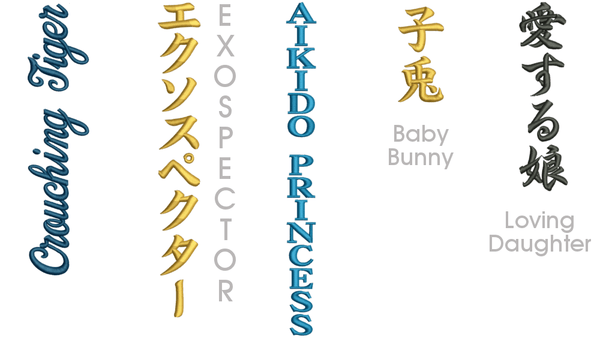 No matter if Ateji or Katakana, the transcription is always based on the pronunciation, ignoring the actual spelling. And the pronunciation especially of a given names depend on the language, the country and maybe even the region you live in (as well as your Gender in some languages). A very common name like "David" for example exists in most western countries but its pronunciation, and therefore the Japanese transcription, varies. Because it can take quite some time to figure out a proper translation that takes all these variables into account we do not offer this service before we get your order. The good thing is, that we have staff speaking Japanese, French, English, German, Portuguese, Arabic and a little Spanish, so we get quite far and with the help of the internet we usually get the pronunciation of your name right. And when we say "internet", we are not using Google Translate. That is not trustworthy at all for Japanese. The better solution is to check on Wikipedia. You can also give it a shot yourself and search for a famous person whose name is pronounced like yours and check if there is a Japanese translation of this page. These translations are usually correct, the more resent the better (translation made before the globalization era are, often, anglicized and simplified). 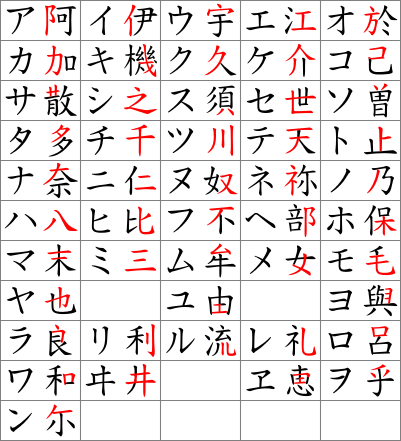 There are also some websites with lists of names transcribed in Japanese, sorted by language or country (not always accurate though). Anyways, it is always helpful if you give us some details, especially if you already know that your name is pronounced wrongly rather frequently or if your name is pronounced in another language than spoken in the country you are living in. And there is another difficulty, even knowing the correct pronunciation, there is often not just one correct transcription. "David" - transcribed based on an English pronunciation - could be written デイビット (De-i-bi-tto) or デビット (De-bi-tto) or also デヴィット (De-vi-tto), to only show 3 examples. And that is why we ask you to attach a picture if you already have an embroidery, so you do not end up having different transcriptions on your equipment. We also do our best by keeping (almost) every file of every embroidery we have made during the last few years. (And this also goes for all engravings! Of course, they have to match your embroideries, too.) But we need at least to know from you, if you have already ordered an embroidery/engraving or not. Maybe you understand now, why shops in Japan often make wrong transcriptions or at least only based on an English pronunciation. No matter how much you care, you can easily end up with unsatisfied customers. And why are we still offering this service, for free, despite all the trouble and the time this takes to do it right? Because as foreigners ourselves, and with you, featuring the mentioned information we need, we are perfectly able to do a good job! Let's have a look now at how an embroidery is made on a technical level. Once we have decided on how to write your name in Japanese, we use a graphic program to create the file for your embroidery, adapting the size depending on the content, rearranging the letters and also changing the basic layout if you wish something special - no problem. From there, it looks rather simple: put the fabric into the embroidery machine and hit the start button. But of course, there is a bit more to it if you want to end up with a high quality embroidery that lasts. The tension of the threads and the whole machine, both are actually quite fragile, reacting to the thickness and quality of the fabric that is embroidered, as well as to temperature or humidity changes. Using a bobbin that, depending on the amount of thread on it, is 1-2 grams heavier than the one used for the previous embroidery can change everything. Or the belts, varying in their thickness, the fabrics in their surface, we have to be aware of all of it. It is crucial to be constantly adapting all the settings and taking good care of the machine in general to get good results. And yes, it happens that something goes wrong and a product down the drain. For belt embroideries there are two types of embroideries available: Integrated and non-integrated embroideries. A non-integrated embroidery means that you take a finished belt and simply add an embroidery on top of it. It is easy and quick to achieve, the embroidery visible on both sides, exactly as for a Dogi or Hakama. An integrated embroidery< means that you first embroidery the fabric used for the outer layer of the belt and afterwards sew the belt. The advantage of this is that because the lines of stitchings are sewn on top of it, it lasts longer and is invisible on the back side of the belt, when it is finished. However, it is extremely difficult to achieve a good result in terms of the orientation. To perfectly center an embroidery that has a length of about 16-20 cm - quite common for foreign names, is almost impossible. The workshop we chose to handle this, is by far the best in Japan we have ever worked with (We've worked with half a dozen); they do an incredibly good job! Considering these facts, resulting in a custom made and not just customized product, also makes it a big deal more expensive. But in my opinion it is all worth it, opting for an integrated embroidery for your black belt, that you will keep for many years of practice. The name David (デビット) written in Katakana on the left sleeve of a jacket, at a standard size of 2.7 cm per character, consists of about 1500 stitches and roughly takes 3~4 min to embroider. Considering the density of the stitchings needed to embroider over a whole surface, a logo for example of the size of about 7x7 cm consisting of about 25000 stitches can easily take about 30 min. The more often you make the machine cut the thread during the embroidery and therefore slowing down, the more time it takes. But the more often you do that, the better the quality and the prettier the result. Removing an embroidery without any damage is even harder than making the embroidery. It's a skill that only one here really masters. Embroideries are charged by character in Japan. The average cost is 300~500 YEN (tax free) per character, which makes our embroideries far more affordable than when ordered at an embroidery workshop in Japan (due to the average length of foreigners names). And we're using the exact same machines, of course. And by the way, working as a team, in the same building where our stock and offices are, we are fast! We know everyones strength, and when the schedule is tight, the workflow and coordination/timing have to be perfect. Even our boss can jump in to get your embroidery done the same day if necessary! Not everyone can do everything, but we push each other to learn as much as possible in as many fields as possible! You'll find some additionnal details and more pictures on our page "How to Choose your Japanese Embroidery"
Wikipedia has quite a nice set of articles about Japanese language. Published by Joshua Nicholls on January 29, 2018 . The suffix of -dono is only used for first names rather than last names. Published by Jordy Delage on January 29, 2018 . In reply to Joshua Nicholls. Dono is a correct replacement for sama when talking to someone inferior in hierarchy. It can happen that some people say “Joshua dono” but it’s not very polite to use the first name. Combinations of first name and honorific suffix often have a touch of irony actually. I’ve been called -kun by some teachers far older than me, then -dono when it switched to a business relationship because despite the business aspect, the teachers wants to keep this vertical relationship of them being superior to me. First names are preferred with foreigners in many cases, however, dono being formal, it’s combination with a first name would sound quite disrespectful to me.